Packaging Dimensions 4.8 in. x 3.6 in. x 2.6 in. 1 answers Ok so if I have a 4-12 marshall cabinet with all 16 ohm speakers and I use this plate and wiring harness what ohms would each side of the cabinet end up? If your 4 x 12″ is fitted with four 16 Ohm speakers it can be wired for 16 Ohm mono, 4 Ohm mono or 8 Ohm stereo. 1 answers Does this come with wiring instructions? As this is designed as a drop in replacement for Marshall cabs, installation instructions are not included. 1 answers do all measurements align w/marshall 1960a stereo/mono switchable plate? is there a drop in replacement metal (mono) available? This is the genuine Marshall product designed for use in their cabinets. 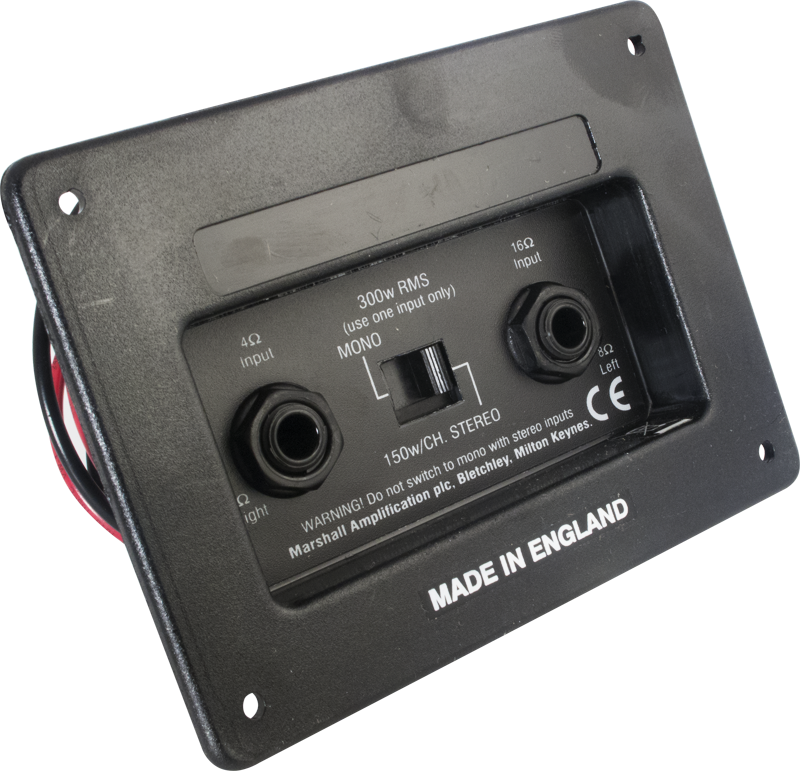 I would suggest using the measurements provided on this page to compare them to your existing plate for compatibility.In terms of genuine Marshall products the standard Mono plate part number would be S-H801 though this is not metal. 1 answers I have a Marshall AVT 412A speaker cab. Can I make this stereo? Depending on your speaker impedance and wiring scheme the cab could definitely be run stereo. In terms of this jack plate's compatibility with the cab I wouldn't be sure. 1 answers could I wire 2 x 4ohm speakers to stereo at a 4ohm load per speaker and then have the mono chanel have an 8ohm load wired in a series? This is more than likely possible since the jackplate doesn't have any active components but the markings on the plate itself won't have the correct impedance. 1 answers Will this fit a 1936 2x12 cab? Hi the best thing to do is measure your existing cab to insure a proper fit. 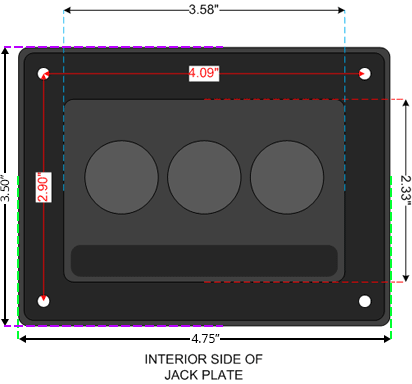 This jack plate has a center-to-center width of 4.09" and a center-to-center length of 2.09". 1 answers Using a 16-ohm cabinet rated at 100 watts, if I use this jack and wire it according to instructions provided (16-ohm Stereo), how is the power split between left and right channels with the original 16-ohm, 25-watt speakers? Since this is a passive circuit, the power will be split in the same way your amp splits it. Typically this is split evenly. 1 answers If I use this with a 2x12 cabinet with two 8 ohm speakers, I should end up with either 4 or 16 ohm mono or switched to 2 x 8ohm stereo, correct? 1 answers How would i wire a 6x12 to this? This question would be best answered by Marshall. Please contact us directly and we can put you in contact with our rep.
1 answers Used this with 2 8ohms speakers what is the mono ohmage? You would have one speaker working in mono at 8ohms. 1 answers Will this work on a JCM 900 Lead 1960? Functionally it should work with any cab as long as it physically fits. You will want to compare the dimensions in the spec sheet above with your cab to insure a proper fit. 1 answers Does this come with mounting screws? This is just for the jack plate. 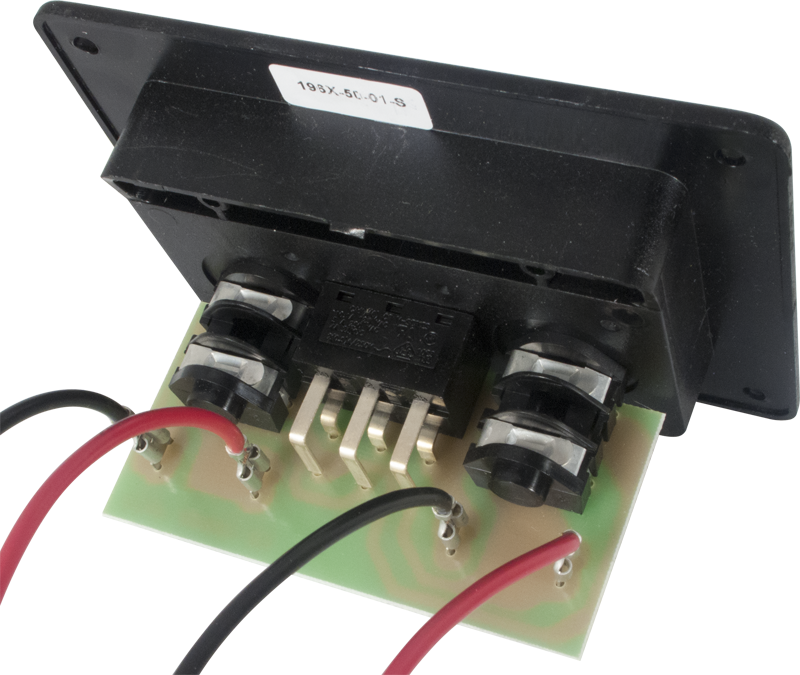 Given that there are different ways to wire a cab, and each produces different ohm ratings, we advise you to consult a tech with questions about speaker wiring and Ohm ratings for cabinets. 1 answers Can I use this jack plate in my 4x12 1960av? Just wanted to replace this jack plate. Old one was all beat up. Glad i replaced it cabinet looks brand new now. Came in a timley manner and i would have no problem buying from amplified parts again. They carry all original marshall stuff. Hats off to you amplified parts. The Marshall 1960A Cabinet I was using had a lot of miles on it. The Jack Plate was cracked at the edge. I plugged in my full stack and the bottom cabinet wasn't working. Without even testing it with a multi-meter, I bought the new Jack Plate from Amplified Parts, installed it the cabinet and VOILA!! It worked perfectly! Thank you Amplified Parts for a righteous product! Play ON! !